Clocking in at 5 minutes and 55 seconds long and encompassing elements of hard rock, opera and pop, Bohemian Rhapsody is certainly one of the more eclectic songs to make it into the charts, but it’s by no means the longest. Hey Jude by The Beatles (7:11), I’d Do Anything for Love (But I Won’t Do That) by Meatloaf (7:58) and All Around The World by Oasis (9:38) are all songs that have managed to squeak their way into the charts despite being about twice the length of most other pop songs. That said, the fact that there are so few songs over 5 minutes in length that have gained that much airtime is a testament to how rare of an occurrence that actually is. Taken from the album A Night at the Opera and credited solely to Freddie Mercury, Bohemian Rhapsody is noted as being one of the most lavishly expensive songs ever recorded. In fact, it was reportedly the most expensive single ever at the time. This was, in part, due to the band ultimately using 180 separate overdubs, which was incredibly tricky to do given that they were working with 24-track analogue tape. Initially, Baker set aside a 30 second strip of tape for the opera section, but had to resort to cutting and adding new pieces of tape to the reel due to Mercury’s habit of “adding another Galileo” every time they tried to record it. Due to this type of thing, the opera section on its own reportedly took almost a month to record. To quote Baker a final time on why this was a big deal: “in 1975 [that] was the average time spent on a whole album”. Although today the song has been lauded as a masterpiece, when recording wrapped on Bohemian Rhapsody, EMI (Queen’s record label at the time) didn’t rate it that highly with their general manager of international sales going as far to say “what the f*ck is this?” the first time the band played him the song. EMI wasn’t alone in this thinking and almost everyone the band played an advanced copy of the song for said the same thing, including Elton John who famous exclaimed “are you f*cking mad?” upon first hearing the song and being told it was going to be the first single of A Night at the Opera. As it turns out, EMI had banked on You’re My Best Friend, being the big hit of the album and they pushed the band to make it the first single. 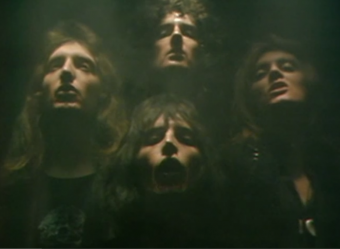 Queen remained steadfast in their decision and told EMI that the first single had to be Bohemian Rhapsody. In response, EMI tried to meet the band in the middle and suggest that they trim the song down, a suggestion that the band quickly dismissed. Exactly how Everett first got hold of a copy of the single early in October of 1975 isn’t clear. Depending on who you want to believe, Everett either asked Roy Baker for a copy after hearing it at a private demonstration or was sent one by Mercury himself shortly after it was recorded. Either way, we know that Everett was asked to kindly keep the record to himself and absolutely not play it on the radio or talk about how he’d gotten his hands on a hot new record live on air. According to Baker, Everett got the message with Baker stating he said, “I won’t play it”, while giving them a wink. You see, the band was still struggling to get their label to make it the first single of the album, so took matters into their own hands. Despite the “strict” instructions not to play it, immediately after getting a copy of the single, Everett began playing clips of the song on his morning show on Capital FM, a popular London based radio station. Each time Everett aired a clip from the song, he’d play it off as an accident, telling listeners that “his finger must’ve slipped” and that they weren’t supposed to have heard anything. Steadily, interest in the song grew. Callers began flooding the station with requests, begging Everett to play the whole song, which he’d by this point built up to a ridiculous degree, telling his now captive audience that he couldn’t play the entire song because he’d been made to promise that he wouldn’t. Eventually, Everett relented and played the entire song 14 times over the course of two days. One critical thing Everett left out about the single was where fans could buy it, causing the station to be visited by hundreds of curious music fans hoping to acquire a copy. Record stores across the country were also similarly surprised when demands began pouring in for the single the following Monday morning after Everett had played the full song. The problem was that at this point the song hadn’t actually been released yet. With the song already something of a hit on the radio even before being released, the label relented and on the 31st of October, 1975, Bohemian Rhapsody was officially released as a single in the UK where it spent 9 weeks at number one. In keeping with Kenny’s predictions, the song is regarded today as one of the finest ever recorded, including being inducted into the Grammy Hall of Fame in 2004. The lead guitarist in Queen, Brian May, has a PhD in Physics. He began the PhD program before Queen made it big, authoring two papers, MgI Emission in the Night-Sky Spectrum (1972) and An Investigation of the Motion of zodiacal dust Particles (Part I) (1973), but then dropped out. He finally went back and completed his PhD in 2007 when his revised thesis, A Survey of Radial Velocities in the Zodiacal Dust Cloud, was accepted. Although the song has been studied and picked apart by critics, poets, English students and fans, exactly what Bohemian Rhapsody is about is still a mystery. Mercury himself would often say that the song meant “whatever you want it to mean” and reportedly described it as “random, rhyming nonsense” to Everett. Since Mercury’s death, his band mates have given similarly unsatisfying answers. Although the song cost a fortune to produce, the accompanying and now iconic music video that was released alongside it only cost about £4000 to make. Mercury’s bed had a piano built into it as the headboard and the singer would reportedly wake up at night and play if inspiration came to him in his sleep. According to the BBC, “This was how Bohemian Rhapsody began”. Bohemian Rhapsody holds the unique honor of being the only song in UK charts history to become a Christmas number one twice with the same recording. Once after its release in 1975 and again in 1991 after Mercury passed away. There are no rough or early cuts of song known to exist, since Queen was notoriously paranoid about having unfinished snippets of their songs stolen. The band would reportedly label the few rough recordings they did make as the work of less popular bands or artists so that that their label wouldn’t bother to make copies if they found them. Smashed Hits: What is a Bohemian Rhapsody? Actually, I just listened to it, which I don’t do a whole lot anymore. I grew up listening to my parents play Queen (Greatest Hits, circa 1980), including this song and it was foundational to my life and I was always a Queen fan. Then Wayne’s World came out and I got completely burnt out on hearing it all the time and all the people thinking it was a “new” song. So anyway, listening to it now, I just say to myself, this song is [email protected]#$ing brilliant! And, it’s too short! I miss Freddie.